The Stones were scheduled to play State Farm Stadium in Glendale on May 7. Now fans are letting Joe know: they can't get no satisfaction when it comes to refunds for tickets. Mick Jagger's reported heart surgery is keeping the Rolling Stones from starting up the American leg of their No Filter Tour. The Stones were scheduled to play State Farm Stadium in Glendale on May 7. Now fans are letting me know: they can't get no satisfaction when it comes to refunds for tickets. 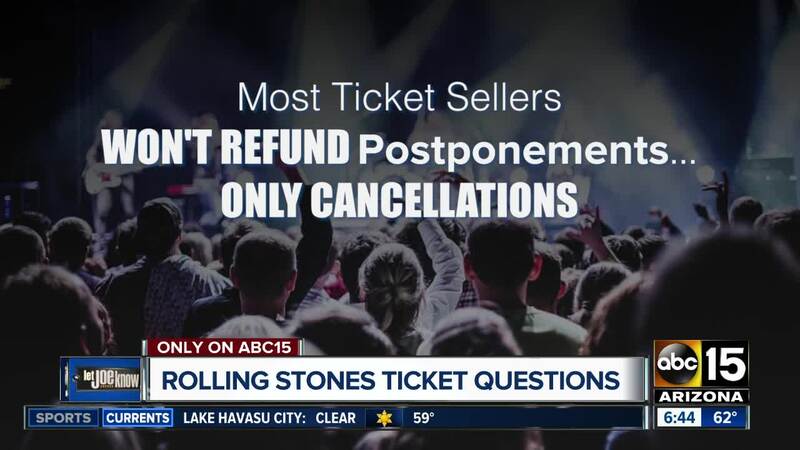 Dano in Phoenix writes he's in limbo "not knowing for certain how long the Rolling Stones concert is postponed for or canceled." That's important because most ticket sellers won't refund postponements only cancellations. So what if you can't make a future date? Doesn't matter. Fans of Justin Timberlake and Bob Seger went through the same thing last year. Both shows were eventually rescheduled for later dates. So, while you can't always get what you want, the Stones asked fans to hold on to their tickets since they plan to reschedule their tour once Jagger's health improves. Ticket sellers disclose terms in the fine print upon purchase. You can try to resell the tickets to someone who is willing to wait or try to get a refund. We have helped some fans get money back in past but this was only after extended postponements.